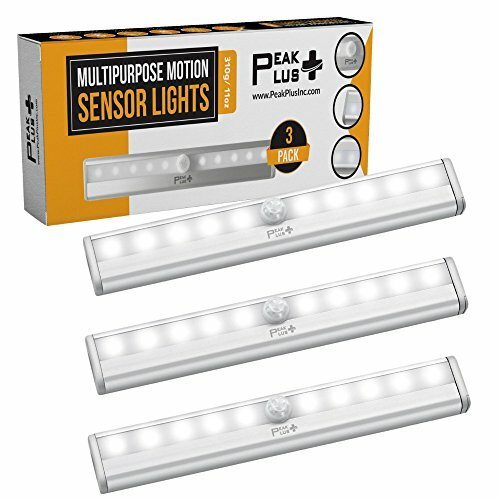 PeakPlus is offering this battery operated LED light fixtures for your hallway, kitchen, stairs, bathroom vanity, garage, cupboard or bedroom. The sensor range is 120 degrees and the closet light comes at a very convenient and portable size at 7.5 x 1.2 x 0.6 inches approximately. Eliminate those dark scary and dangerous corners and make sure to give our put up anywhere motion sensor lights a try. ✔ Absolutely love them or your money back. We are so confident that you will love your battery powered lights but if you are not satisfied, our products are always backed by our 100% Money Back No Questions Asked Guarantee! Click the Add to Cart button above and get your 3 pack TODAY! ★ APPEAL: So many places and possibilities like the backdoor entry, front hall closet, basement storage rooms, camping trailer, refrigerator, under the kitchen cabinets and dark bottom cabinets, bathroom towel closet, linen closet, your pantry. Illuminate your boat or regular safe, dark passage of a hallway or the front porch to light the doorway, your garage, garden shed and brighten up those dark scary corners. Pretty much anywhere you need extra or safe light. ★ EFFECTIVE: Our quality motion sensor light strips are made of aluminum alloy cases, not cheap plastic fixtures making them extremely durable and stylish. They are only activated via motion within 10-17 ft when the area is sufficiently dark causing no loss of battery life in the daylight. Simple installation of an adhesive strip with a magnetic bar that attaches to the lamp body. You can have all three of them mounted and working around your house within 5 minutes. No tools required! ★ USEFULNESS: Do you hate fumbling at night to find something? Our lights are the solution. The convenience and light output is just absolutely awesome. Our customers are telling us that the 10 LED bulbs in each fixture are surprising them with the amount of light they were expecting and just right for seeing those nighttime tripping hazards. Auto-off after 10-15 seconds of no motion detected. Our motto here at PeakPlus is "attach anywhere for instant light"
★ DESIGN: They are just so handy for the purpose of placing them anywhere. This isn't a hardwired light, saving you the high cost of installing wiring around the house. The magnetic strip mounting makes it a very simple job to swap out batteries. Your electric cost will become slightly, but noticeably lower making them so eco-friendly. Each light operates on 4 AAA batteries (not included). ★ 100% SATISFACTION GUARANTEE: We here at PeakPlus want our clients to be happy, so just in case you feel disappointed with your choice, we guarantee to give your money back instantly, without any hassle. Providing the highest quality to all of you is our main priority and our number one goal so get your 3-pack LED under cabinet lights and more for family and friends TODAY! If you have any questions about this product by PeakPlus, contact us by completing and submitting the form below. If you are looking for a specif part number, please include it with your message.